Other people can be given Night guided tours at the Fabra Observatory. Come and see this magnificent modernist work built by Josep Domenech i Estapà, dedicated to the study of astronomy, meteorology and seismology. The Fabra Observatory of Barcelona stands imposing in the Collserola mountain range since 1904, the year of its inauguration, and has spent 114 years studying the cosmos, the climate and earthquakes. Let yourself be guided by our guides and enjoy visiting the interior of the building, learning both the history of the observatory and the main members who worked and who took care of the Fabra Observatory. Every Friday and Saturday as of October 26th, 2018 to June 1st, 2019 you will have the opportunity to visit the Fabra Observatory, enjoy a conference and the views of Barcelona from the outside of the dome and see the stars through the telescope. Includes:Visit the museum and modernist lounge [auditorium] of Fabra Observatory, observing with the telescope and see the outside of the dome. Includes: Guided tour of the museum and the halls of art nouveau building [auditorium, meridian telescope and dispatch] of Fabra Observatory, lecture, screening of a video on astronomy, observing with the telescope, check the outside of the dome and glass of cava or juice welcome fruit. Important: It is essential to make a reservation beforehand and make the payment. Places are limited. The indicated celestial body is preferential but does not imply obligatoriness on the part of the observatory. Unfavorable weather conditions: The meteorology can prevent the correct observation an average of about three days to the month. To improve the satisfaction of visitors, this year through screens located in the dome of the telescope, there will be an alternative activity in which you can discover one of the scientific works that are carried out in the Observatory: observation and study of asteroids . 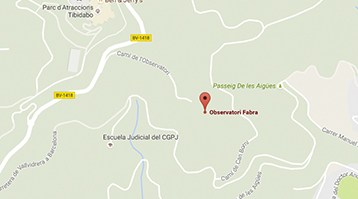 In the Observatory Fabra we have free parking for those attending the nocturnal observations. The activity can be enjoyed by a person different from the one who made the reservation but the amount paid is not returnable. To make changes to the reservation, you must inform with more than 48h in advance of the day that the activity will be done, either to change the day or modify the menu or cancel it. The cancellation of the reservation with refund of the amount paid, can be made within the maximum period of 30 days from the date of acquisition and will incur a cost of € 5. If you cancel after 30 days you will lose the entire amount. The changes and cancellations of the reservation can not be made via e-mail, you must call 93 327 01 21. Sternalia agrees to return the amount within a maximum period of 10 calendar days from the moment the person has facilitated Your account number for the return. The organization reserves the right to cancel the activity for not achieving the minimum capacity required, for occasional maintenance of the telescope and / or if the access or exit of the venue is affected, the participants will be notified as soon as possible when the procedure begins of cancellation. In this case, an alternative date will be offered. Meteorological conditions: The meteorological conditions can prevent the correct observation an average of three days a month. To improve the satisfaction of visitors, through audiovisuals an alternative activity will be carried out where you can discover one of the scientific tasks carried out by the Fabra Observatory: observation and study of near-Earth asteroids. In this case, the activity will not be canceled. Gift vouchers available for the Night guided tours at the Fabra Observatory. Gift voucher recipients can make a reservation for the date of their choice. They can make their reservation by phone at 3 327 01 21 (Monday to Friday 9am - 9pm) and 697 864 262 (Saturdays/public holidays 10am - 2pm). You will be requested to provide the personal details of the buyer and the recipient's name. The cancellation of the gift gift with refund of the amount paid can be made within a maximum period of 30 calendar days from the date of acquisition.